Have a question about lowers for my bike. Can anyone show me what they look like and will they reduce wind on my legs/torso. I have the OEM windshield. Welcome, Old Timer !! I'm not far behind you. Glad that you healed up OK.......as defined by "able to ride again". The above question would, no doubt, get some good responses if you posted it in the Suzuki, C50 sub-forum. Seems that a lot of folks don't read the "new member" messages all the time.....me included. Hi every one I'am new. I am a Fireman with time on my hands. I ride a V Star 650. After reading all your question and in put you all seem to have the right answers. I have two V Sat 650, one classic one custom. the classic, when cold is hard to crank. If you pull out on the choke it will crank for a second and go dead. If you crank with it in it runs ruff and will only Idle. If you give it gas it will go dead. the only way to get it cranked is ease out halfway and let it idle and try to ease on the gas and rev till hot. I spent 500$ having the carb rebuilt.. My other bike ,same year ,cranks right up no problem pull out the choke, let run ,then ease off. Hey, new to the forum. Cheers. I bought an 07 Suzuki M50 VZ800/Z this spring and have clocked a little over 7k mi since. 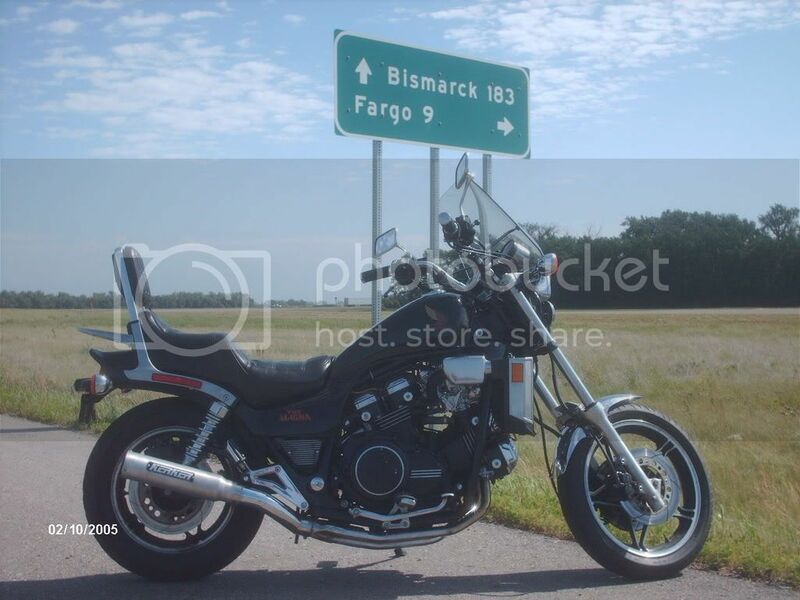 I love the bike, Bought it used with Vance and Hines pipes and some rather Gothem City looking mirrors on it. I managed to throw it under a car a few months ago in my inexpience and broke off a turn signal. I'm ok, no damage otherwise- just part of the sometimes painfull and costly learning experience right? Figgure I'll invest in a riding and safty course this spring. Live and learn. Plans for the winter include new turn signals- dang. A satton black stripe over the tank and fenders, new bags, and wrinkle finnished engine covers and maybe c50 handle bars and forward controls. Just lookin to spend more money right? Hi yall! I am a noob at riding. I have only been riding since June this year but I am totally hooked. I think I have gone to work 3 times in my car since I got the bike . My son has been riding for about 2 years and I was always green with envy when he'd come over on his 636. He reluctantly let me ride it a few times which just fanned the flames. He suggested a 650R, said it would be a good beginner bike... He was right - I love the bike. It has enough power to get me out of trouble and it is light and easy to manouver. Just dropping in to say hello as a new member. Having also unvoluntarily joined the 60 and over club recently, My body insisted that I trade in my fun as heck '01 Suzuki SV650S for something more forgiving in nature. So I brought home a '08 Suzuki Boulevard C50 Special Edition this past friday.Its the Silver Gray with Tribal Graphics/Alloy Wheels/Chrome Studded Seats. I rode it 30 miles on friday, another 40 miles yesterday, and in a few minutes I will be heading out to the west side of Oahu for another 40 to 60 mile run. So far the bike is great, smooth, comfortable and running fine and not a glitch to be had. Anyways, glad to join you all, and will be looking forward to sharing my journey on my C50 with you. Another newbie here. Got a Boulevard S40 as a b-day present for myself, and have proceeded to put over 2000 miles on it since I got my license in July. Don't know why I put off getting a bike so long, it's a blast! Anyway, joined up to hopefully find some good modification ideas, since the aftermarkets a little slim on this model. Semper Fi. I have a 2002 bandit 1200s and it is awesome. My name is Taryn and I am in the Motorcycle Business. I just wanted to see if I could possibly get some help here or if I could help some of you out with my products. Hello everyone I just joined and would like to say hello I just bought my first bike a 1993 Suzuki Katana 600 that had been sitting for about a year and I am slowly rebuilding it and restoring it for the fun of it. Hello everyone, I'm new to the community. I have bee riding since age 10 and own an 81 Goldwing Interstate and an 82 KZ750 at present. Glad to be a member, ride careful. Hello, I am the new guy at the moment. Rode an Elsinore 250 about 33 years ago. Got bitten again at the age of 69. Took the BRC and on my wifes birthday bought a Sukuki S40. Did I catch hell for that? LOL. Rode for a few months and got a 2008 C50T. Thought I was hot stuff and didnot see a red light runner. I was turning and grabbed a handful of front brake. Spent 100 days bed-bound after four days in the hospital. Got back on the bike in mid October and have driven over 1200 miles since then. Having more fun than I deserve. During my earlier years I spent 22 years in the Army and then opened a photography studio in 1974. My son joined me a few years later and I am trying to retire and let him do most of the work. New to this so forgive me. Last edited by SNAFU; 11-22-2008 at 06:50 PM. Greetings all. I just joined yesterday. I currently own a 1997 Suzuki Savage. I rode for years until I had an accident in 1999. I stopped riding until this past spring when something just told me "it's time to get back on the horse." 4000 "training" miles later I am happy to report that I am once again a full-fledged "biker." I am trading in the Savage on a red 2009 Yamaha V-Star Silverado (just went and picked it out today) so I imagine I'll be spending a good amount of my time picking the brains of fellow Star riders. This place looks great. Thanks for having me. it looks like an excellent forum. I'm sure I'll be here a lot. and am in the process of buying a '97 CBR1100XX. Lots to read, so I'm gonna get to it. hello Another new guy here I "ride " a 1994 suzuki Rf 900 bought it in august and jsut got it road worthy today. so yeah i dont ride at all yet. i work on towboats on the ohio river, my scedule is 3weeks on 3weeks off so my posts will show that pattern. I am glad to have found a forum where people know of these bikes and is still being used. whats up everybody? this is my first post. i just bought a 2001 suzuki intruder 1400 and am quite pleased so far. I have prevously owned an 1984 kawasaki kz-550 and a 1999 honda shadow vlx 600. the 1984 kawasaki was destroyed by a 17 year old girl who decided to take my right of way when i was driving stright though a green light(ok it was turning yellow.) i learned a lot that day about riding. never asume anything on a bike. i was lucky that day and really considered what ridding ment to me and if it was worth it. IT DEFFINETLY IS. one day we will all die and to me the risk of riding a motorcycle is completely outweighted by the joy i get in return. by the way i never saw a cent from that bi*ch. she was uninsured and even after sueing the parents i have yet to collect one cent. the only thing i asked was for them to fix my bike. i guess that was too much. my next bike was the honda it was great. kind of gutless on the freeway, but still enjoyable. however after all maintence came up at once. brakes, tires, fork tubes and seals, and chain. the cost was more that i paid for the bike so i sold it. which brings me to the suzuki. Good ratings, horrible revews. the biggest complaints were small tank, horrible at slow speeds, unchanged since it was first intuduced. u know what i dont care, the price was right, i love shaft drive, its done me good so far. sorry for writting so much but i had to get it out there in my first post so future posts will probably be two or three words. well hello everyone.